Cal (the wizard) here. It sounds like many of you had a busy weekend with two auctions going on at the same time. I hope we (I was an absentee bidder in one of them) all had the winning bid on something new and special for our collections. I am going to discuss a few unusual pieces of stretch glass tonight. The common theme is that they are ‘unusual.’ They may also be hard to find or even one of a kind, but they are all not your typical flea market, antique show, auction find. The first item is one which had some of us scratching our heads for a while because it is in a color and out of a mould which a single company did not produce. The mould is from Northwood and was used to produce this bowl in several colors of glass, but they were not iridized. The color is clearly Fenton’s Velva Rose. It turns out that this is one of the moulds Fenton acquired when Northwood ceased operations in the 1920s. And it turns out that this was right in the middle of the stretch glass period and someone decided to make some of these bowls in Velva Rose stretch glass. This is a large piece of glass and a heavy one as well. It measures 17 1/4” wide and is 8 5/8” high to the top of the handles. Does anyone have one of these in this color or in another iridized color? Next is a comport which I just acquired in a Jim Wroda auction. Jim was wondering who made it and reached out to see if I could help. He also had an identical comport in blue stretch in the auction. The shape is US Glass #179. 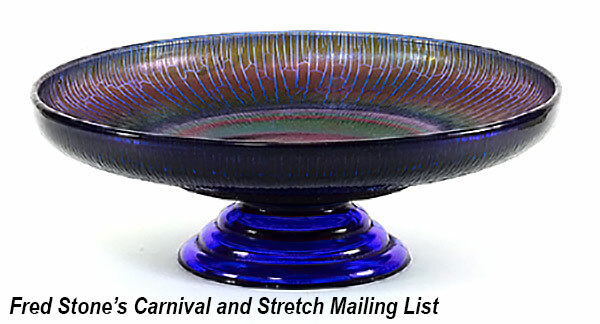 This comport is common in blue and crystal stretch glass. It is also known in the painted on finishes known as ‘Pamona’ in both the blue and yellow and rust and blue combinations. It may also exist in ‘Cumula’ which is a green and white painted on finish. This one is a new color, at least to me. It looks like an attempt at creating ‘amberina’ with paint. 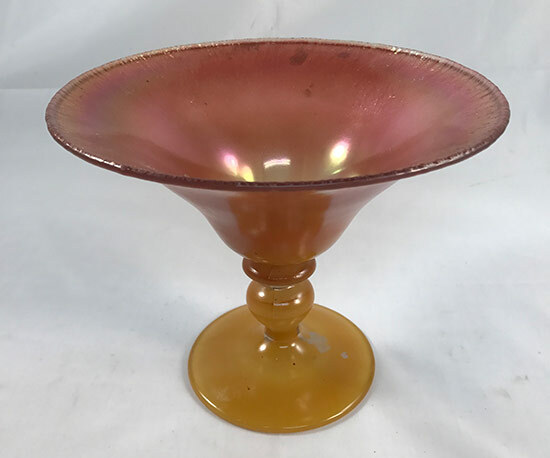 If you look carefully, the base is yellow and the color changes slightly until it is a reddish color at the top of the comport. If this was really Amberina glass, it would be a lot more red but I think they may have been trying to create this look. It is also a large piece of glass, measuring 8 1/4” tall and 6 3/4” wide at the widest point. The base is 4 3/8” in diameter. The third item is a plate which I acquired recently at the Tampa Bay Carnival Glass Club Convention. This plate is common in Celeste Blue and Topaz. It was made by Fenton; Northwood made a similar plate, but the Northwood version will have a circle in the middle from the mould. 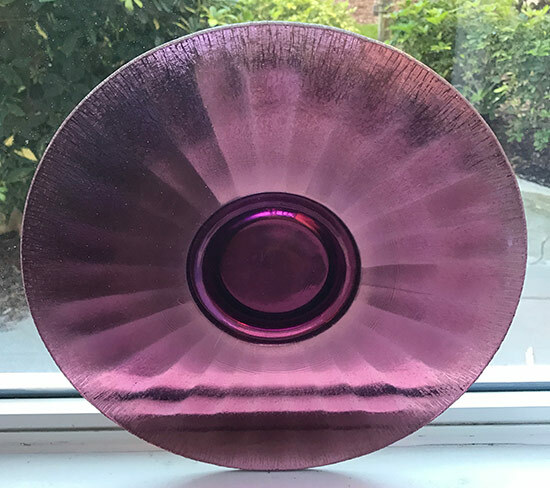 This plate has no circle and is in Fenton’s Wistaria stretch glass. It has optic panels and is 11 3/4” in diameter with a base which is 4 1/4” wide. This plate is also known in Cobalt Blue by Fenton and in several other colors by Northwood. Many thanks to Tom Burns for suggesting the owner show the plate to me for ID and to the owner for letting me see and buy it. I am wondering if there are other colors of this plate in your collections? If so, we would love to see them. That’s it for this today’s Tuesday Stretch. I hope have stretched your interest in stretch glass by sharing these three unusual examples. As always, if you have stretch glass you would like us to ID, Dave, Russell and I are ready, able and willing to put our collective knowledge together to provide you with more information about your stretch glass.